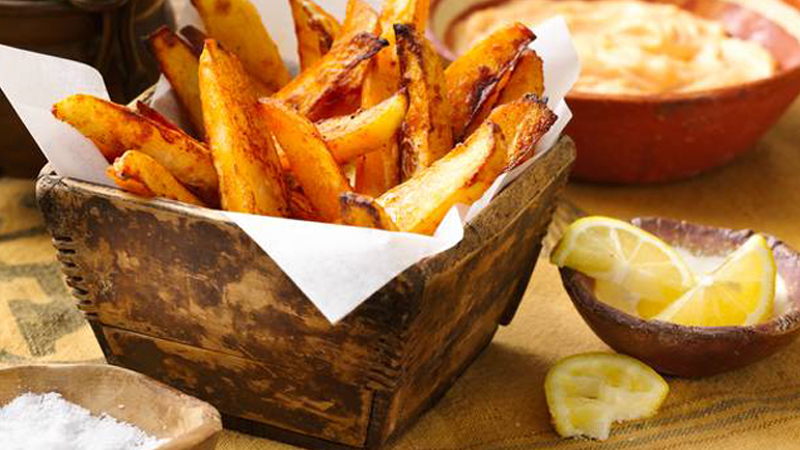 Add some zip to oven-baked French fries with Old El Paso™ Seasoning Mix for Tacos. 1. Preheat the oven to 220ºC (200ºC for fan assisted ovens), gas mark 7. 2. Place the potato wedges into a large baking tray, in one single layer. Drizzle over the oil and turn to coat. Sprinkle with the taco seasoning mix and toss until the potatoes are evenly coated. Arrange potatoes in single layer in the tray again. 3. Cook for 20-25 minutes or until turning golden and crisp. Turn the potatoes with a spatula then continue to cook for a further 5-10 minutes until all sides are crisp and golden. • Substitute sweet potatoes for the baking potatoes. Sweet potato fries will have a softer texture. • Save remaining taco seasoning mix for another use.